No musician will argue the importance of the console in the total scope of the musical instrument. The console is the tool by which the musician is able to utilize the various resources contained in any given pipe organ. With this basic concept in mind, the decision was made to build a new console for the Organ Stop Wurlitzer, capable of handling the instrument’s extensive resources. It was decided to make the console an exact copy of the Wurlitzer design known as the “Fox Special”, the largest console ever built by the company. 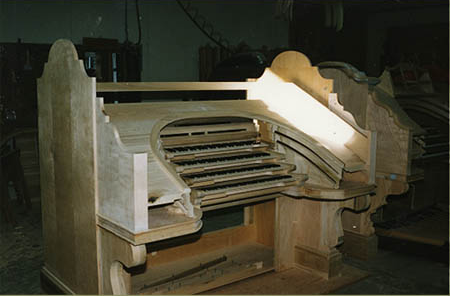 In 1997, the Crome Organ Company of Reno, Nevada, was contracted to do the woodworking for this project. The complex ornamentation, patterned after the Brooklyn Paramount Wurlitzer, was masterfully applied by Carlton Smith of Indianapolis, Indiana. The intricate, extensive gold leaf application was the artistry of Organ Stop employee, Karin Copeland, and Organ Stop Co-Owner Pat Rowan. The overall effect is stunningly elegant under the spotlights which make the gold leaf decorations sparkle as the console rotates on its lift platform. The combination action has 99 independent memories for all 113 pistons. In addition, the stop rail division markers can act as pistons if desired, increasing the number of available pistons to 125. There is complete MIDI implementation across all divisions elevating the Wurlitzer into modern day musical instrument technology. Another unique aspect is the incorporation of a digital rhythm unit which can be programmed to play many of the organ’s traps and percussion instruments in complex musical arrangements. The result is performance of rhythm tunes which are much more authentic and exciting than could otherwise be achieved. There is also a complete record and playback system with extensive editing features which is utilized for all of Organ Stop’s award winning recordings.